We prepare your Wedding Favours in our premises in Cornwall. Your words are printed on the front of the packet with a colour photo of the flowers. Sowing instructions are printed on the back. The seeds are packed in a small glassine bag inside the seed packet. 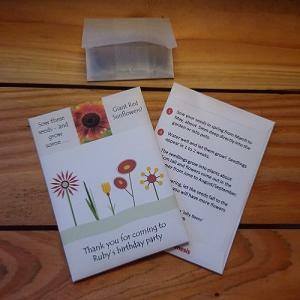 Seed packets are printed in full colour on good quality 100g/m2 paper. Each packet measures 95mm x 80mm in size. We can use a wide range of seeds inside the packet. Contact us with requests. We prepare your Party Favours in our premises in Cornwall. Your words are printed on the front of the packet with a colour photo of the flowers. Sowing instructions are printed on the back. 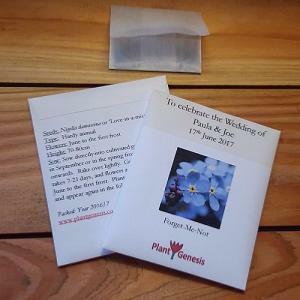 Seed packets are printed in full colour on good quality 100g/m2 paper.